causes gal bladder stones, lead which leads to mental retardation, fluoride which causes fluorosis, arsenic which causes poisoning and iron which causes constipation & dysentery. 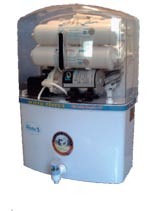 The safest solution to all these problems is WaterDoc Reverse Osmosis (RO) Pure Water System. 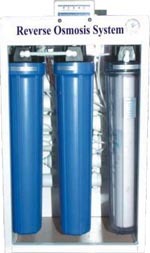 The RO system is a 5 stage purification system. The water passes through a semi-permeable membrane of 0.0001 micron gauge, which filters out even the tiniest of microbes, soluble or insoluble pollutants and even softens hard water. 1st Stage : Removes sand, silt, dirt & rust particles. 2nd Stage: Removes chlorine, organic matter, colour & bleaching liquid. 4th Stage: Removes dissolved salts, organic, germs, bacteria,virus, compound metals & harmful metals. 5th Stage: The bacteriostatic Silver Impregnated Carbon prevents growth of bacteria at the point of use &removes colour & odour, thereby restores the water’s natural taste.